It's been a long while since we've seen such a psychedelically cutesy mobile slot, but Cloud Tales has blown us away. Mushroom island, mystery eggs, symbol switches, multipliers, wilds and re-spins are all part of this game, but more than that, the colourful little monsters make this slot a real stunner. So ignore the possibility that this slot was imagined up after a long night out in the club, and appreciate its great features in this Cloud Tales mobile slot review. It's not every day that you get to play a mobile slot that's got fluffy creatures jumping around on clouds and spinning reels that are shrouded by rainbow coloured bubbles whenever a winning combo is struck. But that's precisely what Cloud Tales is all about. Brought to us by iSoftBet, Cloud Tales is heavily influenced by the social media games that many of our friends (and mums) enjoy playing. So if you're into low variance slots, with which you can stretch your budget for hours on end, and love overly-sweet mobile slot themes that would fit in perfectly on a tablet screen of a toddler, then you'll be delighted with this mobile slot. First things first, we have never written about this software developer before, so we thought some introductions are due. iSoftBet is a game studio based in London and Luxembourg, with licences to release gambling software in UK, Italy, Spain, Belgium, Portugal and Alderney. Although its ambitions so far might be European only, and it is still a tiny studio when compared to the giants such as NetEnt, IGT or Microgaming, it's worthwhile remembering that all of those started out small too. iSoftBet develops games in a unique way, and it's believed that the design and the gameplay employees work separately, and only come together to finalise the game for the very last stretch in the process. Fascinating! Perhaps that's precisely why you get such a whacky combo of cute, animalistic monsters and gameplay that will entertain for hours on end. Specialising in mobile and tablet games, it has such a vast and varied games portfolio, that it's quite hard to put a finger on what games it's the best at. For example, there's the modern Jackpot Rango or the Neon Reels slot, but also movie themed Nacho Libre and the TV themed 90210. One thing seems for sure with iSoftBet – it's got much more potential, and we can expect it to continue working and coming up in the ranks of mobile slot developers. 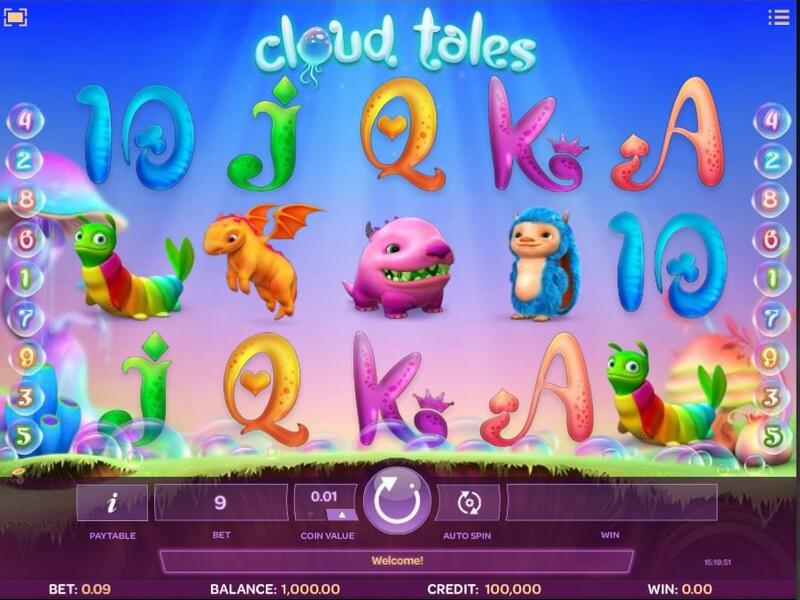 And with more and more casinos signing up to feature their games, you'll be able to find Cloud Tales in more sites than just Leo Vegas. We think that most of mobile pay by phone casino gamblers will enjoy this theme, not because they're very much into fluffy animals, bubbles or jumping around on pearl clouds, but because of the keen eye for detail that's been used to develop it. The graphics, the sounds, the transitions and everything in between, have been thought of extensively and implemented with absolute precision. The result is a slot that is a stunner and despite the theme being so unconventional, we don't think it's going to turn anyone away from this mobile slot. The reels themselves are invisible or transparent, whatever you want to call it. This means that the whacky symbols are simply floating about, but you also get the added benefit of nothing obstructing your background view of clouds and magic mushrooms. We do think iSoftBet could've worked on the game for a while longer, as the lower paying symbols are just card letters such as J, K and Q. That just seems like such a cheap way out and definitely doesn't add to the authenticity of the Cloud Tales slot. What's The Winning Potential Like? Of course, no amount of cute animals would matter if you couldn't win some real cash. Rest assured that this five reel and nine fixed payline slot does offer you plenty of potential to walk away with your pockets filled with cash. The range of bets from 9p to £9 per spin gives you freedom to be as picky and choosey about the level of risk that you want to take. And while the return to player is an average 95.5%, the maximum win you can achieve on Cloud Tales is £9,000 for collecting the maximum number of blue furred hedgehog symbols on the reels. We have to say that a sizeable number of gamblers will find this game too simplistic and lacking in terms of gameplay. That might be because there aren't thousands and thousands of ways to win, dozens of paylines or massive bets of hundreds of pounds that can be placed. And indeed, a maximum base game win of £9,000 is nothing when compared to payouts of games such as The Rift with a maximum pay of £51,000. That said, if a handful of medium wins and the very occasional high win when the top paying symbols are combined are enough to please you, then you'll find Cloud Tales just fine. Meanwhile, we'd advise for high rollers to look elsewhere. There aren't many features in Cloud Tales, which is quite different from what other software developers are currently doing. Namely, packing in dozens of features and sub-features appears not to be in the interest of iSoftBet. Instead, they have maxed out the base gameplay options and made it as lively as possible, without offering extra spins or a bonus game. The Mushroom Island is a special symbol that can only ever appear in the middle third reel, but trust us – it will be worthwhile the wait until it does show up! It will not only act as a Wild itself, but it will also populate the screen with many, many bubbles, which will generate many Wilds on the screen. These Wilds will then go on to transform into symbols that can yield the largest win that's possible. We love this feature not only because it's quite rewarding, because it could mean you get multipliers upwards from 40x, 100x or even 200x your wager, but also because it ‘s fun to watch it happen on screen. This ethereal mushroom island bounces around spewing out bubbles, which then float about and land on random symbols. And of course, even if you don't get the Mushroom Island to populate your screen with wilds, you can still get them in the base game. Wilds will substitute for any other symbol except the Mushroom Island and the Mystery Egg to bring you max wins. Want to play Cloud Tales? Cloud Tales is a cute mobile slot filled with fuzzy animals and psychedelic features! Cloud Tales Cloud Tales certainly won't appeal to those among us, who are looking for featured packed slots such as Guns N Roses. There is no massive progressive jackpot to wrestle for, nor are there are bottomless extra spins rounds. What this game does offer is a unique theme and very simple gameplay that can brighten up a dreary day - who wouldn't love to see the bright fluffy animals play around on clouds? That's what dreams are made of. Add the bubbles that float about and the ethereal cloud backdrop, coupled with the cuddly animations whenever a win is achieved, and you've got yourself cuteness overload. Alright, perhaps not everyone's dreams, but Cloud Tales can still be engaging and fun because of the features that it does offer. Those can take a big win and give it a welcome multiplier boost, making it just that much more extra special!